When it comes to luxury cars, one usually tends to focus on what's inside the cabin rather than bothering with what's under the hood. 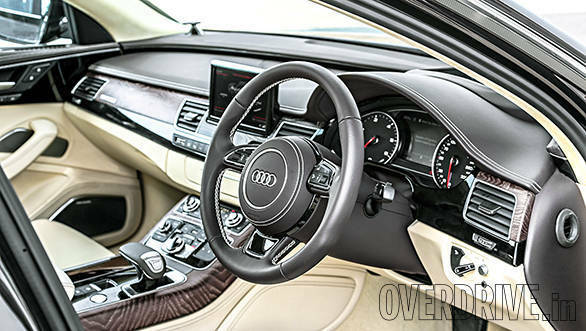 But when you're given the option of sitting in an Audi A8 with the number 60 appearing before the TDI badge and a V8 stamped on the front quarter panel, then you might as well ask for the keys and settle down behind the wheel rather than the more conventional left rear seat. 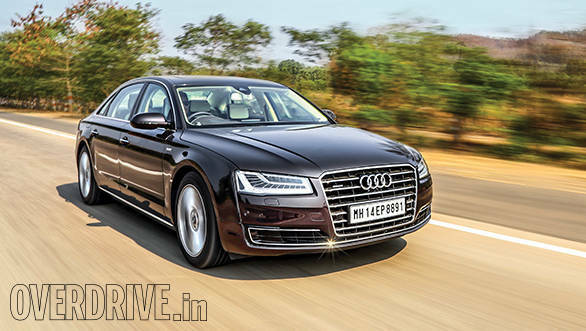 The Audi A8 L 60 TDI is the diesel flagship of the Audi India line-up. 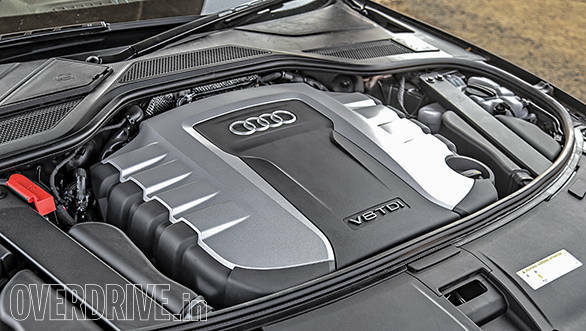 The number 60, as per Audi's new nomenclature means that under the bonnet lurks an oil burning V8, churning out 385 horses and a massive 850Nm of torque. A facelift last year saw the addition of the brilliant Matrix headlamps, revised bumpers, trapezoidal tail pipes, dynamic turn indicators and a slightly revised bonnet. The interior also features the new Unicum soft leather that we've seen in the 3.0-litre variant but in our test car, this was in a very pleasing dark brown and beige dual tone. The dash is typical Audi with a clean wrap-around layout and there's a neat head-up display that gives you speed and navigation information. The rear seats are kitted out with the aircraft style recline and massage functions and there's even a fridge and 230 volt power socket to power your gadgets. The rear seats are a place to travel in ultimate comfort with the air suspension absorbing the worst of what the road has to throw at you and the great noise insulation making for a fairly quiet cabin. It's behind the wheel where there's some fun to be had in this uber luxury car. The 4.2-litre V8, with its truck load of torque, combines with the Audi Quattro four-wheel drive system, to give excellent acceleration at all speeds. A decent prod on the pedal when pulling away rewards you with that great feeling of being pushed back into the seats from the sheer force. It takes just 5.4 seconds to reach 100kmph and it will keep on accelerating rapidly through the 8-speed Tiptronic gearbox all the way to an electronically governed 250kmph. Switch your brain into cruise control, turn the drive setting to Comfort and then there's masses of smooth torque for calmly cruising down the highway as well. I also loved the brilliant Matrix LED headlamps. Turned to Auto mode, they allow you to drive with full high beam without the fear of blinding oncoming traffic. The system even detects cars in your lane and lowers the beam so as to avoid blinding the driver through the rear view mirrors. 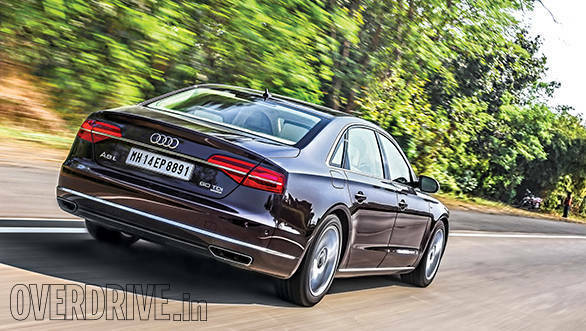 The A8 L 60 TDI, with its brilliant torquey engine, safe Quattro four-wheel drive system and practical Matrix headlights, makes a decent case for itself. It's also the only large-engined diesel on offer with the other players only bringing their big petrol engines to India. At Rs 1.30 crore ex-Mumbai, it's also the cheaper of the more powerful luxury cars, undercutting both the BMW 750 Li (Rs 1.4 crore) and the Mercedes-Benz S 500 (Rs 1.4 crore) by a good Rs 10 lakh. If you're the kind who likes to travel in luxury but are also inclined to get behind the wheel, every now and again, then this could be the motor for you.